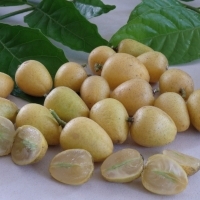 This attractive, evergreen, slender tree has been described as the finest fruit of Siam (Thailand). It is also a highly valued backyard tree in southern China and south and east Asia. It is classed as a subtropical fruit but is relatively hardy and can withstand light frosts. This tree is a relative of the citrus family, thus its ability to grow in coastal Australia as far south as Melbourne and inland where the frosts are not too severe. 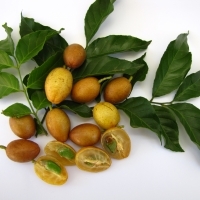 The fruits are highly aromatic and can be sweet to tangy to almost sour depending on the variety and ripeness. Straight from the tree wampees are very refreshing, thirst quenching and cleansing to the palette. They form in clusters from a few up to eighty in one bunch. 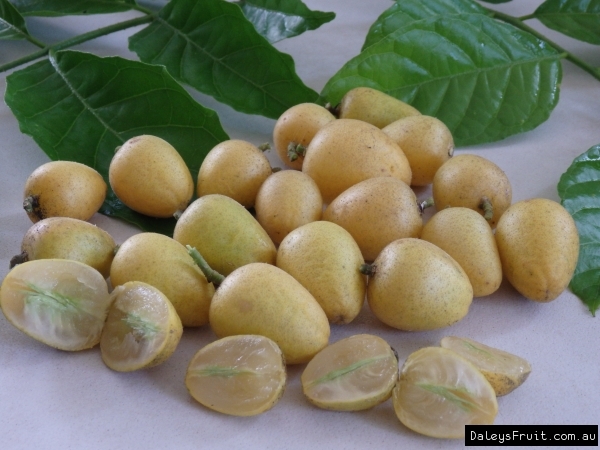 The fruits turn yellow when ripe and have a thin, sometimes brittle skin, somewhat like paper. 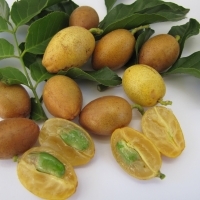 They generally have only 1-2 seeds in each fruit and are best left to ripen on the tree for as long as possible. They are a very attractive looking tree that can grow up to 8 metres with, beautiful dark green ruffled compound leaves. They have a dense growth habit making them an ideal shade tree. Wampees should be treated very much like any of the other citrus trees in regard to cultivation. A sunny, well drained site with plenty of water and organic matter should see these trees thrive. The crop is borne solely on the tips of branches, so the less pruning the better. Very few problems have been observed with pest and diseases other than occasional infestations of aphids. Mature trees can produce up to 50kg of fruit each year. Like its close relative the citrus it is full of vitamin C, approximately 28mg per 100g. This fruit can be used for making jams, jellies, pies, drinks but best eaten fresh, straight from the tree. If you want them to keep a bit longer you can try leaving the stalks on them.